Alan Shaw’s modern translation is the most accurate in terms of conveying the original’s lexical, semantic and stylistic characteristics, as well as its idealistic spirit. 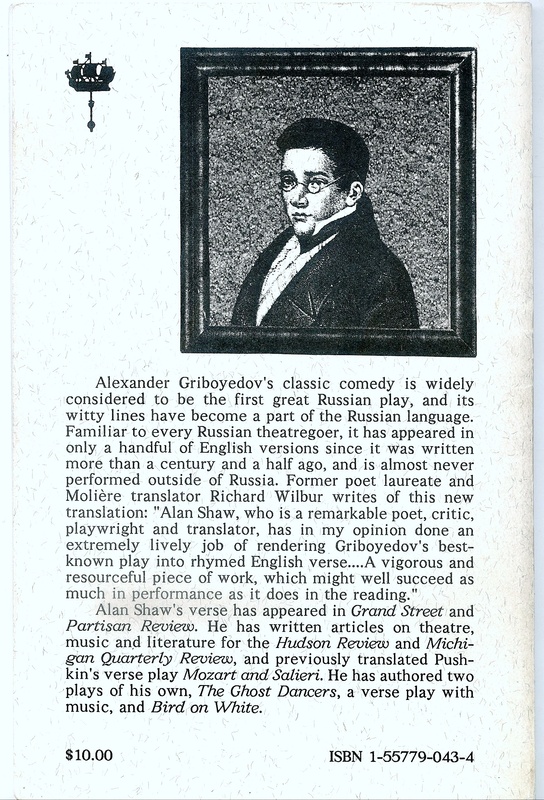 – N. Voronova, Griboyedov’s Comedy Woe from Wit in English Translation: Reception and Interpretation. (in Russian) PhD Dissertation, Saratov University, 2005. Published 1992 by Hermitage, Tenafly, NJ. Out of print. Second edition in preparation. Those interested in producing please contact me for PDF of current text.